Reba is a nine-year-old, spayed German Shepherd. 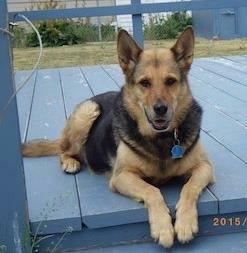 This lovely girl is “Reba” a Nine Year Old Spayed German Shepherd. She is feeling kind of lost right now because her elderly owner was hospitalized a couple months ago and will not be returning to the home they have shared for 9 years. Reba has a faithful neighbour who has been caring for her, while her owner’s situation was determined… Now it’s time to find her a new “fur-ever” home. I met Reba at a lovely park in Whitehorse about a month ago… A beautiful girl who is all about that “ball”… She is a very fun dog who loves going for walks and swimming… She still has a lot of energy and is loving and devoted. She is very good with people, but not so much with other dominant dogs and small dogs until she becomes acquainted with them. When she gets to know them, she has proven a good team player. If you are interested in adding Reba to your family, and giving her a loving retirement home – you can fill out an adoption application.